The farm is on seven acres with orchards, gardens and three green houses. 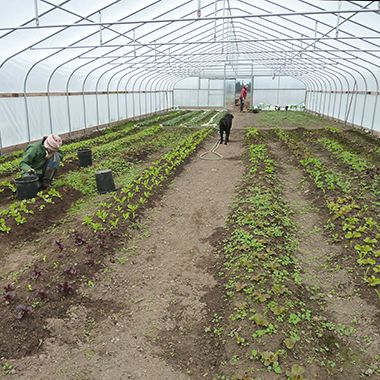 They start seedlings early in the season, transplant to raised beds, grow hot crops and also late season growing. Kelly and Christie use materials on the farm for an aggressive composting program, making use of chicken manure and cast off vegetation. Crops are rotated annually, and each year a different area lays fallow to rest, covered in mulch to eliminate weeds in large areas. They water from Agnew Creek which runs through the property fed off the Olympic Mountains, which make a gorgeous backdrop to their farm.